Dzeko's ban will see him miss the crunch Serie A game against AC Milan on Sunday, as the sides race for Champions League football. Meanwhile, Roma coach Eusebio Di Francesco said he is not contemplating resigning. "Resignation? Let's leave that sort of talk aside, the thought has never entered my mind," he told reporters. "I think any sort of comment would be superfluous, whether it be technical or tactical. All I can do is apologise. It was a terrible performance from every point of view." 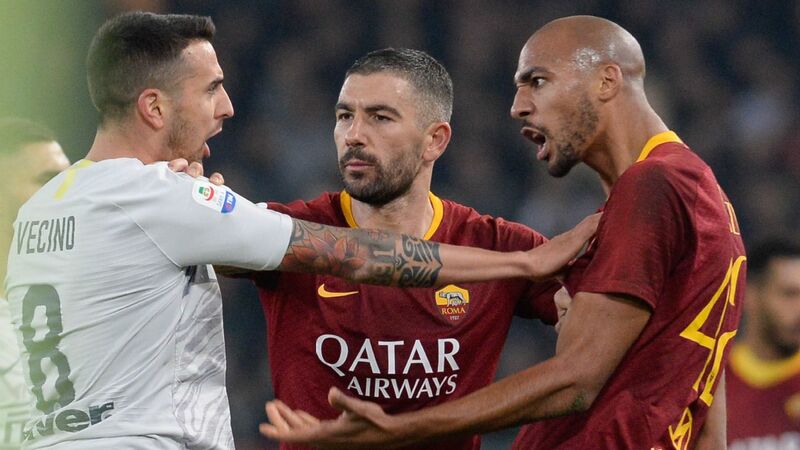 "I want to get inside the lads' heads and understand what is going on," said Di Francesco, whose team have suffered embarrassing league defeats to Bologna, SPAL and Udinese this season. "A few games back people thought the squad had bounced back, and instead we collapsed again too easily," he said. "The main thing is the mentality, that ability to keep battling away in games even when things are going wrong - to stay together when things are going badly, not having the wrong attitude during the game."